We value your support! Thank you for partnering with us! 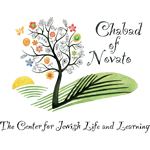 Chabad Jewish Center of Novato is dedicated to providing every Jew regardless of background, philosophy or level of commitment, an open door environment for strengthening and enhancing Jewish family life. Chabad serves individuals and families looking for an anchor and non-judgmental, accepting, personalized Jewish experience. Chabad is reliant on independent donations and supported solely by our community. And all contributions are invested right here in our community. To join our growing list of our Chai monthly partners click here , to make a one time donation, please continue below. Every donation is 100% tax deductible. Our organization is a non-profit 501(c)(3). Tax ID#:45-3127955.